The Foxleigh family is steadily growing in size. The first Foxleigh who arrived in 'Souls ( in June 2012) was Kenna Foxleigh (created and played by Westy). 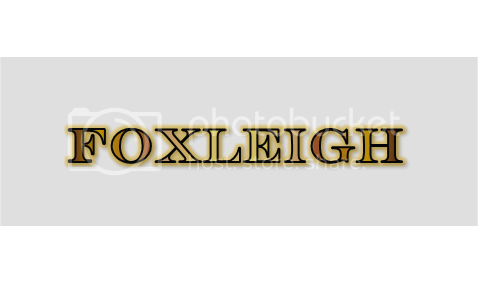 The Foxleighs are generally known for their Western American heritage and hard work ethic. Their name is a portmanteau of Foxburrow & Raleigh. Characters was adopted by Characters. "Buck" The Rules: A palomino quarter horse stallion belonging to Claire Foxleigh. Kickin' Up "Dust": A buckskin quarter horse stallion belonging to Kenna Foxleigh. Moonbeams On "Black Ice": A blue roan shire mare belonging to Rowan Foxleigh. "Autumn" Sunrise: A chestnut quarter horse mare belonging to Adrian Kido. "Mudrucker": A bay quarter horse mare belonging to Dakota Foxleigh. Iakopahua: A grey Andalusian stallion belonging to Kaiolohia Noelani. Tracker: A black Labrador belonging to Dakota Foxleigh. Mele: A female golden eagle belonging to Kaiolohia Noelani. Moo: A male black and white cat belonging to Kenna Foxleigh. The Foxleigh family is predominantly made of gray wolf and rough collie hybrids. They range from looking particularly wolfish to mostly collie to an even blend of both. More often than not they will have a fondness for anything western and are hard workers. Specific fur lengths, eye colors and heights are all traits commonly passed down through the generations. The most commonly occurring eye color in the Foxleigh family is blue, followed by yellow and green. Heterochromia due to collie genes is not uncommon in the second generation (Faolan, Kale, Ty, Kjintora). Sky Blue (#009ACD), Royal Blue (#2B7DE3), Ocean Teal (#388E8E) are prevalent shades (Kenna, Skylee, Faolan, Malia, Kale, Ty, Kjintora). Less common are Deep Gold (#EEAD0E) (Rowan, Kale, Kjintora) and occasionally a Greyish-Green (#77896C) (Dakota). Kido influence has added Honey Brown (#6C4211) (Faolan, Ty, Oakley). The Foxleigh's are known to produce members with fur that tends to be slightly longer along the elbows, calves/ankles, tail and chest. Black eye patches are also a common marking among the Foxleighs. Fur colors range from Caramel Brown (#B67C3D), Saddle Brown (#8B4513), Sign Brown (#603311), Burlywood Light Brown (#CDAA7D), Reddish-Brown (#993300), Creamy-Tan (#DFAE74), Cream (#F5DCA3), Black (#000000) and some Corn Blonde (#FBEC5D), Gray (#7a7a7a), Dark Grey (#363636) and sometimes white (#FFFFFF). Patience, gentleness, charm, protectiveness, observance, loyalty, intuition, hard worker. Flirtatiousness, wit, outgoing nature, passion, loyalty, helpfulness, hard worker. The Foxleighs have all been Luperci Ortus since the virus first appeared. Specific details about their ancestry and history is either lost or simply unknown. Generally originate in the Western United States. Tend to make livings around horses, livestock and farming. Typically all children are given their own horse to raise from birth. Since the first generation, species biases are not common. Tend to be lovers of social gatherings and drinking whiskey. June 2012 - Kenna arrives in 'Souls and joins Cercatori d'Arte. Fall of 2012 - Kenna enters an open mateship with Adrian. Winter of 2012 - Kenna meets her younger brother Rowan for the first time. Spring of 2013 - Rowan becomes mates with Kaiolohia, and they leave CdA to travel abroad. Kaiolohia becomes pregnant shortly after. April 16th 2013 - Kenna's children, Skylee and Faolan, are born in Cercatori d'Arte. June 27th 2013 - Rowan's children, Malia and Kale, are born in Wyoming. October 2013 - Adrian (captured by slavers) disappears from CdA. Honrin Wolfe-Denahlii steps in as a father figure. November 15th 2013 - Kenna's second litter of children are born: Kjintora, Ty and Oakley.